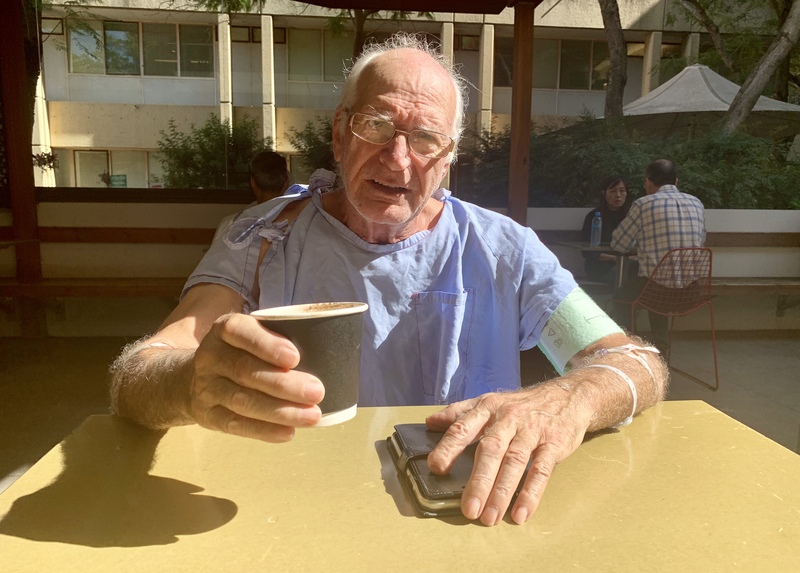 Angelo Papa enjoys a coffee under the sunlight at Westmead Hospital. Westmead Hospital patient and Italian ‘nonno’ (grandfather in Italian) says it’s a miracle he is walking again. After a three hour surgery yesterday to repair blocked arteries in his hips and legs, Angelo was back on his feet and enjoying a coffee in the Zouki courtyard today. “I thought I was going to die but look at me, I’m walking around,” Angelo said. “I had pains and couldn’t walk. They did a three hour surgery on me yesterday. Angelo is a ‘nonno’ to 14 grandchildren. He looks forward to seeing them once he is discharged from hospital. Angelo is expected to be discharged tomorrow. He plans to get straight back into gardening, a popular Italian pass time. “When I get home I will go straight back to my gardening,” Angelo said. “I grow carrots, beans, lettuce and spinach. I also grow persimmon, it’s like a tomato.